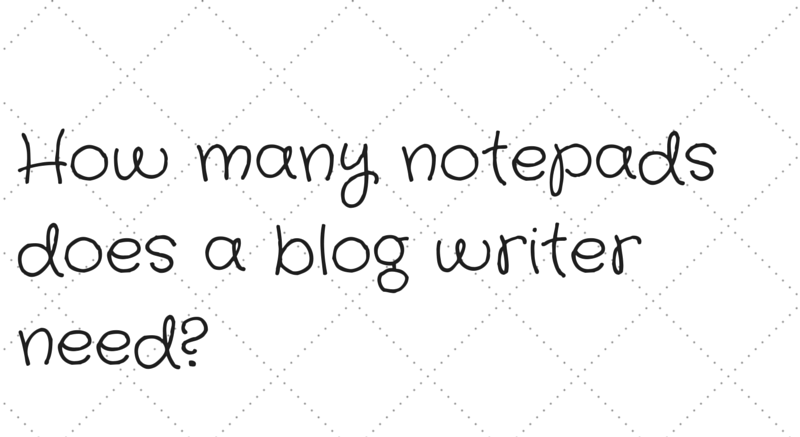 How many notepads does a blog writer need? It’s my first real effort at getting rid of some of my stuff and compared to previously I have decided to be more pragmatic in how I choose to clear my possessions out. “How many notepads does a blog writer need?” I think, as I clear out a draw full of items related to writing. This is not to be mistaken with the draw next to it, which is full of sketchpads and drawing materials. It’s depressing as I realise my writings are like a mausoleum full of unfinished ideas and broken dreams. The notepads come from all over, jotted ideas recorded on company property, shopping lists from my parents home or pads I had to buy on impulse as something needed writing and I had nothing handy. Now they occupy the draw. From research, I realise I am a bit of a hoarder. Things would be worse if I didn’t find big clear out theraputic. The notepad hoarding falls into the category of “I may need this one day”, but I remind myself of my original question and although I hate waste, half a dozen scratty notepads fill the bin. The clear out is an education in my personal development as I look at past goals long forgotten. I realise I have treated my self-improvement as a tick list, once completed moving onto the next idea. There are scraps of wrapping paper and used envelopes that I decided to keep – they would be useful when I sold all this crap on ebay. Like I would ever make time for that! So in the bin they go. There are lots of wires – phone chargers and outdated IT equipment. I make hard decisions as I debate whether a USB extension lead is needed. I imagine an unlikely scenario where I set some IT equipment up and find the USB cable is not long enough. I realise I am going back to the “I may need this one day” hoarder logic and chuck it away. So I decide if there is anything I may need one day, then I will just buy a new one. I am also guilty of being a hoarder-consumer, as so much of my clutter was purchased on impulse. “If I buy this, it will make me happy.” And yet they never did, thankfully in recent years I have cut down this habit as money becomes tight and I realise they never quite give me the satisfaction I desire. So I clear out a load of CDs and DVDs from under my bed, which were bought on impulse to fill the void – giving me a couple of hours pleasure at best. I dig out an Insanity boxset, borrowed from a friend. I guess they never got big fitness results out of it as they never asked for it back. Perhaps one day they will find what works for them, for me fitness DVDs have nothing on going to the gym, so I put it in my car, ready to return. I really got into reading the Rebus novels by Ian Rankin, despite not being a big fiction reader. So I bought the whole collection instead of working through one book at a time. I got bored with reading and so they occupy a large space. I could get rid of them but decide to challenge myself to read them. Another draw is a hidden archive of my achievements – a graduation photo, a note from my old school to say I had won the history prize and a newspaper cutting of my first 5k race win. I feel good inside and it reminds me what I can do with drive and hardwork. I don’t want to throw these away, so I create a little scrapbook to show off my achievements. I come across documents and a portfolio from my old job – it streched my potential and made me feel angry that I no longer get challenged in my current role. This makes me more motivated than ever to find a new job. There are medals from various races scattered about the house. As a child I was so envious of a friend who had lots of sports trophies and medals on display, yet as an adult I have all these medals, but do not show them off. I make a note to create a display for them. I assemble a big pile of stuff to sell, delibratley leaving them in an intrusive place so that I do not forget about them. This will remind me to get rid of them. It’s getting late, dust is flying and there is still lots to clear. Guess I will sort the rest out tomorrow. My mom is a hoarder… Like those people from TV shows. Its bad!.. I went the opposite way and try to get rid of EVERYTHING… Except notebooks/papers/pencils. I just can’t do it. But good for you, getting rid of what you don’t need. I find the less you have the more the things you do have mean to you… So I guess you’re right, its very therapeutic. Good luck with the rest! Thank you for your kind comments. I think your comment that the less we have the more the things we do have mean to you is very true!